The <failure> element of the <add> element in the <applicationPools> collection configures the actions to take when an application pool fails. The autoShutdownExe, orphanActionExe, rapidFailProtection attributes of the <failure> element can be especially useful when troubleshooting or debugging applications, because they give you the flexibility to specify the action that Internet Information Services (IIS) will take when an application fails, such as running an external executable to log or debug the failure. IIS 10.0 The <failure> element was not modified in IIS 10.0. IIS 8.5 The <failure> element was not modified in IIS 8.5. IIS 8.0 The <failure> element was not modified in IIS 8.0. IIS 7.5 The <failure> element was not modified in IIS 7.5. IIS 7.0 The <failure> element was introduced in IIS 7.0. IIS 6.0 The <failure> element replaces portions of the IIS 6.0 IIsApplicationPools metabase property. 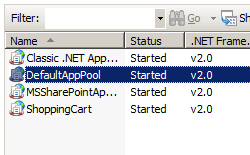 The <applicationPools> collection is included in the default installation of IIS 7. 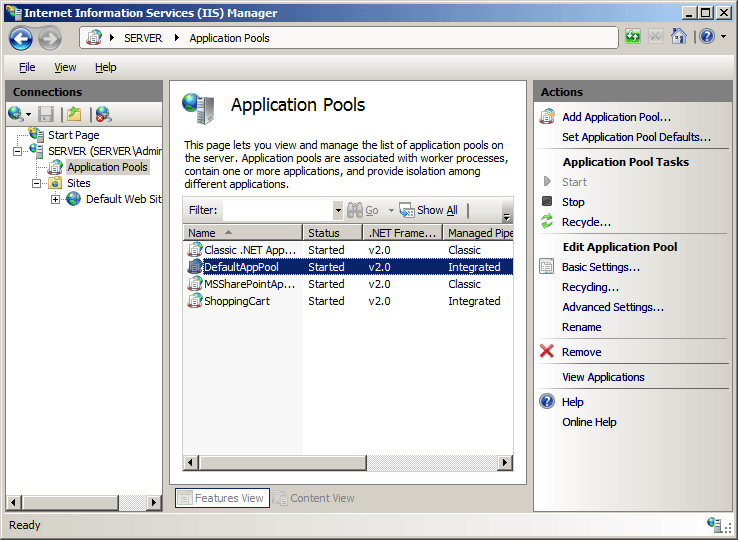 In the Connections pane, expand the server name, click Application Pools, and click the application pool you want to edit. In the Advanced Settings dialog box, click the rapid-fail protection property that you want to edit, then edit the value in the property value section of the dialog box, and then click OK. For example, change the Failure Interval (minutes) to 4 and Maximum Failures to 4.
autoShutdownExe Optional string attribute. Specifies an executable to run when the WWW service shuts down an application pool. You can use the autoShutdownParams attribute to send parameters to the executable. autoShutdownParams Optional string attribute. Specifies command-line parameters for the executable that is specified in the autoShutdownExe attribute. loadBalancerCapabilities Optional enum attribute. Specifies behavior when a worker process cannot be started, such as when the request queue is full or an application pool is in rapid-fail protection. The loadBalancerCapabilities attribute can be one of the following possible values. The default value is HttpLevel. Specifies that a 503 error code has been returned. Load balancers that are not HTTP aware will not switch to a different node because the 503 response tells the load balancer that the computer is healthy. Specifies that the TCP connection will terminate. This is useful when you use a load balancer that is not HTTP aware. orphanActionExe Optional string attribute. Specifies an executable to run when the WWW service orphans a worker process (if the orphanWorkerProcess attribute is set to true). You can use the orphanActionParams attribute to send parameters to the executable. orphanActionParams Optional string attribute. Indicates command-line parameters for the executable named by the orphanActionExe attribute. To specify the process ID of the orphaned process, use %1%. orphanWorkerProcess Optional Boolean attribute. Specifies whether to assign a worker process to an orphan state instead of terminating it when an application pool fails. 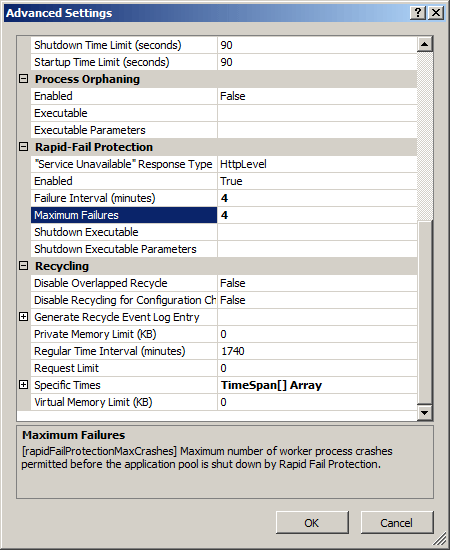 The number of worker process crashes has reached the maximum specified in the rapidFailProtectionMaxCrashes attribute. The crashes occur within the number of minutes specified in the rapidFailProtectionInterval attribute. rapidFailProtectionInterval Optional timeSpan attribute. Specifies the number of minutes before the failure count for a process is reset. The default value is 00:05:00 (five minutes). rapidFailProtectionMaxCrashes Optional uint attribute. 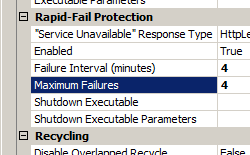 Specifies the maximum number of failures that are allowed within the number of minutes specified by the rapidFailProtectionInterval attribute. Note: Starting in IIS 7.5 this value must be between 1 and 2147483647. The following configuration sample enables rapid failure protection for a single application pool named DefaultAppPool, configures a rapid fail protection interval of 5 minutes, and sets the maximum number of failures within the number of minutes to 5. The following code examples enable rapid fail protection for the DefaultAppPool on your server, then set the protection interval to five minutes, and set the maximum number of crashes to 5.